Chennai, 26th February 2018: Indian Institute of Technology Madras is establishing a National Centre that will work to modernize India’s ports and fast track waterways. The National Technology Centre for Ports, Waterways and Coasts (NTCPWC) will be a strategic and innovation-oriented initiative tasked with bringing cutting-edge Technology to India’s Ports, waterways and Maritime Sector. 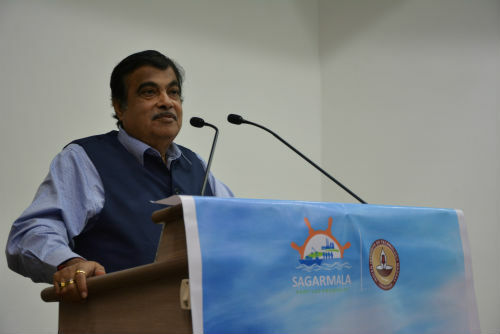 Shri Nitin Jairam Gadkari, Honourable Minister for Road Transport and Highways, Shipping and Water Resources, River Development and Ganga Rejuvenation, laid the Foundation Stone today, 26th February 2018 for NTCPWC, which is being supported by Sagarmala Project, Government of India Shri Kailash K Aggarwal, Joint Secretary (Sagarmala), exchanged the MoA with Prof. Bhaskar Ramamurthi, Director, IIT Madras. “We are financially supporting the NTCPWC with Rs. 70 crore at an initial level but it will be self-sustaining in three years,” added Shri Nitin Jairam Gadkari. Sagarmala is a strategic and customer-oriented initiative to modernize India’s ports so that port-led development can be augmented and coastlines can be developed to contribute to India’s growth. Being built with a Capex of Rs. 44.79 cr and Opex of Rs 25.74 cr, the NTCPWC will create capital equipment, capable manpower and build competencies to work on Ten major projects for the first three years. Its’ thrust areas would be Technology Development, Modelling and Software Products, Bridge Simulator and Testing Facilities. The Nodal Officers for the NTCPWC will be Prof. V. Sundar and Prof. K. Murali, both from Ocean Engineering Department, IIT Madras. The NTCPWC will work as the Technology Arm of Ministry of Shipping providing the needful technological support to ports, Inland Waterways Authority of India (IWAI) and other institutions. It will focus on technological innovations and evolution of new ideas and breakthroughs for the port, waterways and maritime sector and provide effective solutions to an extensive range of problems being faced in the industry through scientific support and carry out education, applied research and technology transfer. The inception of NTCPWC is an answer to a key need and signifies a major leap in indigenous and cutting-edge technology support in the Port and Maritime sector. 2. Creating state-of-the-art technologies and application products. 3. To enable fast-track innovations in order to provide most appropriate solutions to various challenges. 4. To create a pool of competent manpower equipped with state-of-the-art theoretical and practical knowhow.